Winter can rub your skin the wrong way... dry itchy skin is the main concern of many these days. The key is applying a nourishing and rich moisturizer daily. Purple Essentials Mango Body Butter is a magnificent moisturizer, that is can easily aid your daily personal care routine in a variety of ways. It is a delicious and decadent treat for your skin - packed full of skin nourishing nutrients and emollients, that provide deep hydration and lasting effects. Premium essential oils of Sweet Orange, Vanilla, Benzoin, Ylang Ylang and Cinnamon. This product has a butter like consistency, and melts with the heat of your skin. It is a waterless formula, which provides a longer shelf life and highly concentrated product. To use: remove a small amount of the Mango Body Butter from container with a clean utensil (keeping fingers and contaminates out of the product helps to protect it's shelf life and nourishing properties). Melt in your palm, by rubbing hands together and massage into skin, allow 1 minute for skin to absorb butter and wipe away any excess before dressing. Provides rich moisture and deep hydration to the skin. Helps to restore youthful glow to skin. Soothing and anti-inflammatory (helps with rashes, bug bites, itchy skin...). Healing properties for numerous skin conditions (eczema, dermatitis, psoriasis...). Improves skin's elasticity (great for preventing stretch marks). Contains a natural UV protection. Helpful to young and old, even pets. Body moisturizer - apply following bathing, while skin is still damp, to lock in moisture, or apply to areas as needed. Softens cuticles and helps to prevent hang nails. Condition nails, prevents brittle and dry nail bed. Relieves redness and scaling on skin. Softens and repairs dry patches (elbows, heels...). Provides an effective moisturizing treatment to hands & feet, when used at night, while your body is in "Rest & Repair Mode" -Simply massage Body Butter into hands/feet, slip a cotton sock over each hand/foot... when you awake in the morning... viola! Throw the socks into the laundry and enjoy your smooth skin. Make up remover - spread a light layer over makeup, wait 30 seconds and wipe away. Deep conditioner for dry hair - comb through ends. Relieves sun and wind burn. Dab a small amount on your lips for a conditioning treatment and gloss. Helps tame frizzy hair - pull small amount through as a pomade. Mix a small amount of Mango Body Butter with some of your favourite mineral foundation. Mix together on the back of your hand. Use less mineral foundation in the mixture for a sheer coverage and add more for increased coverage. Once you arrive at the desired coverage - apply and buff with a makeup brush to remove any streaks. Blot with tissue and set with a dusting of translucent powder. The beauty of Body Butter... you just never know how many ways you will find to use and enjoy it. 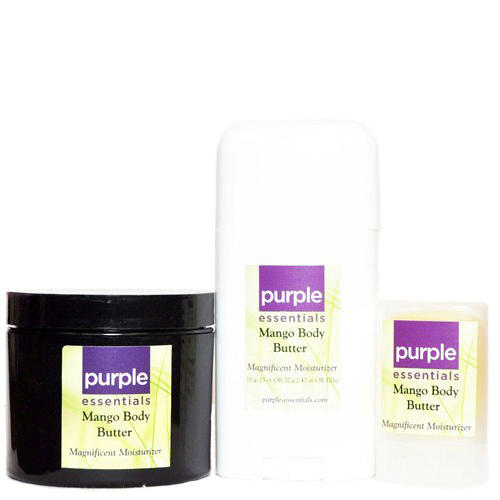 Purple Essentials Mango Body Butter - available in 12 g (6$) or 65 g tube (22$) or 120 g jar (36$).